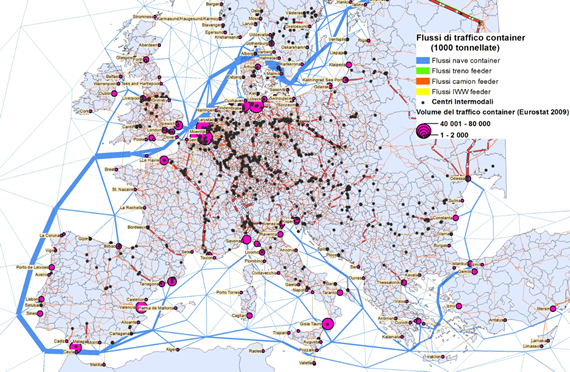 TRUST (TRansport eUropean Simulation Tool) is a European scale transport network model developed by TRT and simulating road, rail and maritime transport. 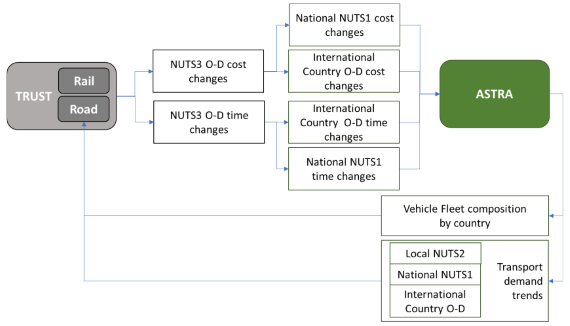 TRUST covers the whole Europe and its neighbouring countries and it allows for the assignment of origin-destination matrices at the NUTS3 level of detail (about 1600 zones) for passenger and freight demand, based on Eurostat data, national statistics and ETIS database. TRUST is calibrated to reproduce tonnes-km and passengers-km by country consistent to the statistics reported in the Eurostat Transport in Figures pocketbook. 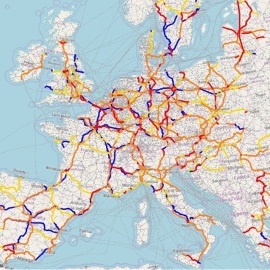 TRUST road network includes all the relevant links between the NUTS3 regions, i.e. motorways, primary roads as well as roads of regional and sub-regional interest. Road network links are distinguished in different classes, each with specific features in term of capacity and free-flow speed. Additional corrections to the link characteristics are also applied to take into account of specific conditions, e.g. links in mountain areas are explicitly recognised. 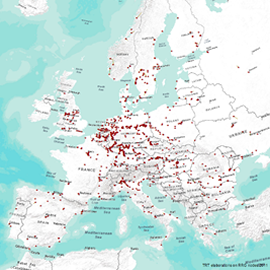 The European tolled road network is modelled on a country basis, i.e. national tolls are applied and those links where extra-tolls are levied (e.g. tunnels) are modelled case by case. Car matrix is segmented in short and long distance trips and by trip purpose. The freight matrix (tonnes transported by vehicles above 3.5 tonnes) is segmented in domestic (short, medium and long distance) and international trips. Also ferry connections (Ro-Ro services) between European regions and between European regions and the North Africa are explicitly modelled with their travel time and fare. Developed in the context of the European project Livingrail, the rail component of TRUST is conceived to evaluate the current usage and the future rail transport development in Europe. TRUST rail network, based on the TRANS-TOOLS and ETISplus rail networks and other integrations, includes different link types according to technical elements (number of tracks, electrification, maximum speed allowed, etc.). 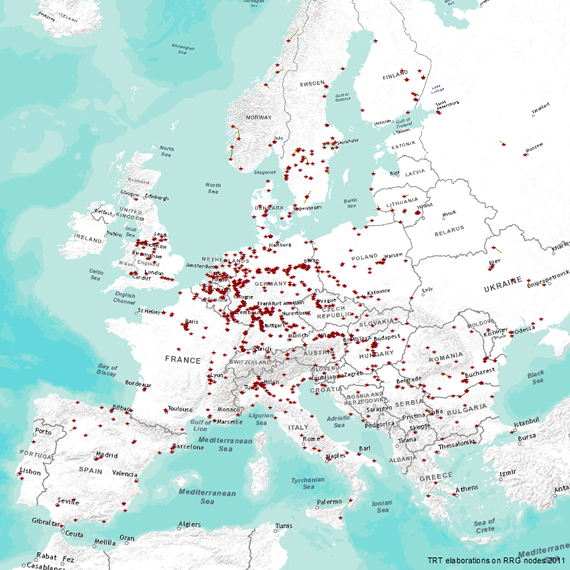 Rail supply includes 917 intermodal terminals in Europe where loads are transferred between road and rail. This second type is further split according to the average train load (700, 1200 or 2900 tonnes). 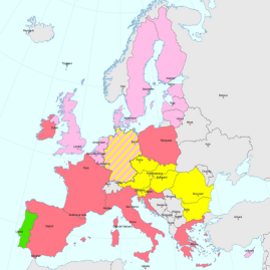 Developed in the context of the European project ESPON TRACC, TRUST models maritime connections between the main ports in Europe through fictitious links simulating sea routes and allows the computation of distances and cost of maritime transport. TRUST simulates as well feeder modes accessing ports (e.g. truck, rail or inland waterways according to existing infrastructures) allowing the definition of full path between true origin and final destination of freight. Ports are classified into three categories: bulk (BLK) ports, container (UNT) ports and general cargo (GCG) ports. Most of the ports belong to more than one category but some ports have only one or two specialisation. Maritime demand consists of origin-destination matrices segmented according to the three freight categories of bulk, container and general cargo. The TRUST model has been applied in several projects in combination with the ASTRA strategic transport model. 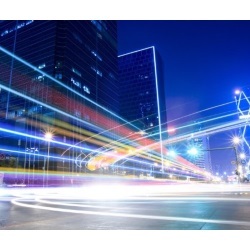 ASTRA (ASsessment of TRAnsport Strategies) is a system dynamics model applied since more than 20 years for strategic policy assessment in the transport and energy field. 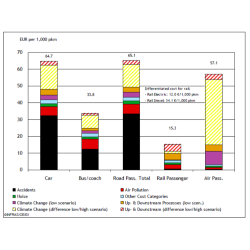 With this linkage, on one hand the economic and social dimensions can be added to the impact assessment of transport policy measures simulated in details on a network basis and, on the other hand, the transport impacts of infrastructure projects implemented in details on the network can be taken into account for strategic analysis. Policy assessment capabilities in ASTRA cover a wide range of policies with flexible timing and levels of the policy implementation. Potential policies include standard setting, infrastructure pricing, fuel taxation, speed limits, carbon taxes, trade policies etc. A strong feature of ASTRA is the ability to simulate and test integrated policy packages and to provide indicators for the indirect effects of transport on the economic system. More info can be found at: http://www.astra-model.eu/TRUST-network-model.htm. The experts from TRT Trasporti e Territorio are available to provide more details on TRUST model and on its potential applications.